I recently received a 6 month trial license for Advanced Web Ranking through SEOBook.com, the normal trial period is 1 month – membership has it’s privileges. However, after trying out this software I soon discovered the value of it and the limitations of a trial licence – clever marketing! Advanced Web Ranking is a intuitive piece of search engine ranking software which is a must for anyone who has an online presence. From the humble blogger to the multinational corporations it is important to understand how you rank for your top keywords. Why? Because it is one of the metrics which tells you how relevant the search engines sees your site to your desired keyword sets. Search Engine Friendly – the software replicates the way in which you would manually interrogate the search engines to find your rankings without getting banned. Rank Evolution Charts – allows you to see at a glance how your site has preformed over time. Scheduled Updates – Rather than wait about during the day for AWR to run you can schedule tasks to run at night so in the morning you can see how your sites rankings have been affected. Keyword Suggestions – Working closely with your site may lead you to believe that you know all the keywords for your sector, but this may not be the case. You can easily check for keywords you may have missed using Advanced Web Ranking software which uses keywords from Google Suggests or Wordtracker. Google and Yahoo API – The Google AJAX API allows you to query the search engine programatically. This service is offered by Google for customers who follow responsible best practices for search engine queries. The Standard Version of Advanced Web Ranking is ideal web ranking tool for the independent website owners who are not required to produce reports for their investors or board. Create printable reports – this feature allows you to produce tailor made reports for any keyword or search engine. Send reports by email – Provided you have your computer on AWR will send you the ranking results to your email address making this software as good as a web based ranking tool. Submit to search engines – Not only can you use AWR to submit your website to all the search engines but you can also submit to all the directories on its data base. Local Search – AWR allows you to query Yahoo and Google Local at city or region level. This is ideal for forward looking local business which are focused on the local market. Project Manager – AWR allows you to generate a large number of projects. This features allows you to organise your projects in a more meaningful way. 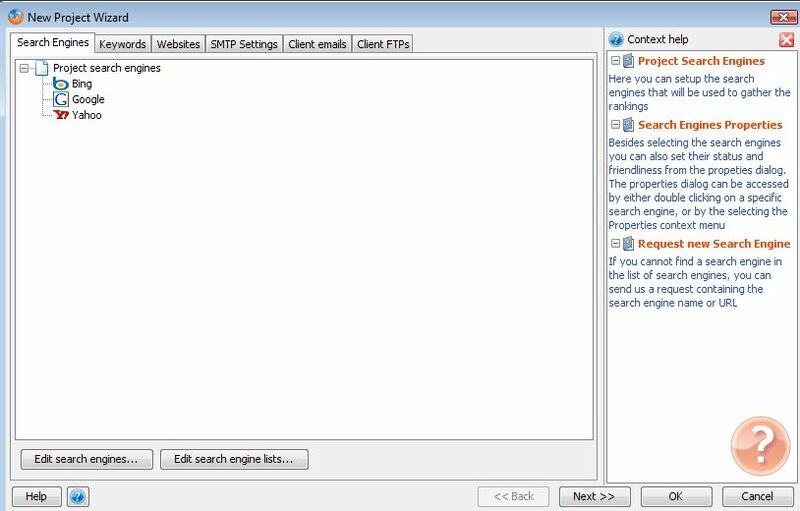 Keyword Research Tool – Research your keywords easier and more accurately using multiple keyword research tools. User Profiles – This features allows for multiple users to be easily managed from one place. Get authentication, rights management, audit and custom profiles for each user. Proxy per project – Get the same search results your customers see in their part of the world by assigning a proxy server to each project. Triggers – You can define a condition with the help of the customizable filters and you will receive a special report with only the data you are interested in, when that condition is true. This licence contains all of the above features but has one more important feature – Shared Data Base. This feature allows multiple clients to connect to the same database. Using a TCP/IP server the client applications can access a centralized database. The Standard version is relatively intuitive and easy to use. When you launch AWR a project wizard pops up where you can either load a project or create a new project. If you don’t have a project already saved then you can easily set up a new project. After supplying your keywords and details of your website AWR project wizard will then close and you’ll be taken to the desktop screen. AWR will start analysing your rankings automatically which may take some time, depending on the number of keywords you’ve used. Once completed I would recommend playing about with all the features before adding another project. Like AWR, Advanced Link Manager is a feature packed tool. ALM allows you to keep track of who is linking to you and your competitors sites. So why are links so important? Links are another one of the metrics used by search engines to establish the quality of your site. They see the link as a “vote” of the quality of your site. You wouldn’t link to site which was not related to your sector or a poor quality site would you? And so this is why the search engines to put so much stall into links. Of course there are free options out there but none of the free ones have all the above features and more combined and in a reportable form. In fact I would go as far as saying that the free link checkers cost you time which also equates to money – if you’re in the SEO business! I do a full review of this software in the near future. I have found AWR very useful tool. It is ideal for establishing a ranking baseline for a series of keywords. From that baseline it is easy to track the impact of your link building strategies has on rankings and hopefully traffic. For those who are running a small SEO company the report generation and email features of the Professional version will be ideal. For a larger SEO operations who are running numerous projects at one time the Project Management feature of the Enterprise version will be essential. Of course there are some really good free web ranking tools out there, but you always have some form compromise when you are using them. With AWR yes it costs but as with everything in life you get what you pay for and with AWR I believe the package that they supply is easily worth the cost.